It's not quite as magical as a flying carpet, but renting a limousine is certainly a romantic way to wheel around in style on your wedding day. 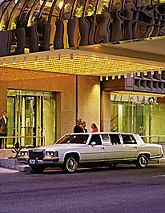 Determine what size vehicle you will need, for example, a six, eight or 10-passenger limousine. Decide if you'll need more than one car. Plan on spending from $60 to $125 per hour to rent a limousine. Of course, this can vary. Visit the limousine company and inspect the vehicle you want to rent. Check the vehicle for cleanliness and special features such as a sunroof, television, telephone and bar. Limousine passengers age 21 and up can legally consume alcohol. Find out whether the limousine operator has a backup vehicle in case of emergency. Check out the company's credentials and make inquiries about its driver experience and its safety record. Verify that the company is adequately insured.